This entry was posted in Uncategorized on April 17, 2019 by mogens. Among the otherwise uncertain global events, I would like to share with you an unnoticed milestone. A bit over 40 years ago, the Voyager-1 space probe was launched. I vaguely remember the event while attending Gymnasium/High School. It was a one in 150-year event, as it used a special planetary line-up to accelerate beyond the reach of our solar system. Incredibly, Voyager is still transmitting data. How about a 40-year old car, still cruising along without maintenance? Unless we develop a new and outrageous space probe, Voyager-1 will remain mankind’s farthest reach into space – forever! Imagine, for a moment, yourself sitting on the probe and looking toward our sun. Occasionally, you can spot Neptune, Uranus, Saturn, Jupiter, Mars, Earth, Venus, and Mercury, while you are cruising at 17km/sec (10mi/sec) away from the sun. We may choose to ignore Climate Change, abruptly terminate life with nuclear war, jump out from a Trump Tower – or who knows what? Regardless, Voyager will continue to sail away, and perhaps someday meet an alien civilization that is compassionate, thoughtful, caring and foresightful. This entry was posted in New Year's Messages on February 20, 2019 by mogens. Does “just because we can” imply that we should? Take a look at this? This is a pile of bison skulls. 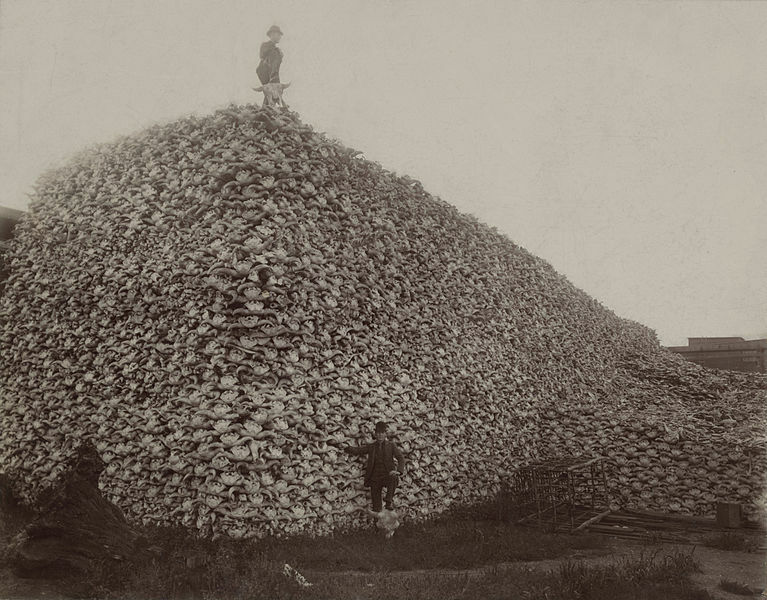 All gathered from carcasses brought down by holiday bison hunters, facilitated by the new railroad lines post US civil war. Yes, the bison was hunted to extinction, and the Indians brought to starvation. This entry was posted in Uncategorized on March 1, 2018 by mogens. The Paris accord sought to limit the long term temperature increase to well below 2C, and to strive for 1.5C. With this goal in mind, a worldwide carbon budget was created. First, let’s talk 2C temperature rise. Why do we focus on limiting the increase to 2C? Because, beyond that the impact will be devastating. An increase of just 1.5C will be catastrophic for all low-lying living areas, such as most Pacific islanders, and that goal was included specifically for them. On days like today (January-2018) it may feel nicer. 2C is just an average, but it doesn’t explain what we can expect from weather. It could be much higher temperatures at the poles; for instance, at current projections, we’ll in the next 10-30 years have triggered the massive Greenland ice melt which will happen throughout the next centuries. That alone is about 7m of sea level rise. This will happen! The key question to ask from this is; what will the many impacts be for us? Actually – we all know. But we either feel helpless, of choose to ignore it. In 1990 the first IPCC report was written. Since then our emissions have continued to grow by 60%. Last year, 2017, we were up 2% over 2016. The US for instance has done very little to concertedly reduce emissions. The switch to natural gas over coal for preferred electricity generation has been fueled by economics. We have completely and totally failed for 28 years! We continue to waste our carbon budget. And no – we cannot blame it on world population, because 10% of us account for 50% of CO2 emissions, and I’ll leave it to you to figure out where the 10% live! As an adult voting generation, we are guilty of passing a tremendous heap of garbage on to our children. The goal set by California, which is to reduce emissions by 80% (8% p.a.) by 2050 is not sufficient, and the plan is fraught with potential problems. Like many governmental plans, it includes a large (questionable) biomass related component. Without going into details, our Governor recently directed agencies to review this subject in light of the recent fires. One likely outcome is that the state must be more aggressive with reductions through other means. In order to stay within the 2C Paris accord, we must reduce worldwide emissions by >10% p.a. Additionally, there’s an equity component for which we need to budget extra. But let’s face it, even 10% is going to be incredibly hard, and I suggest we try to do better, but at minimum stay with that. So for 2018; we need to be at 90% from last year. For 2019 we save another 10%, and so on. The key is to aggressively reduce emissions immediately, because by delaying we make it we just make it much harder. Oh, and the Pacific islanders and company? Well, I fail to see any option other than to migrate away from rising waters, and for us to start making room for displaced people! This entry was posted in New Year's Messages on February 8, 2018 by mogens. There are too many ideas for improvements from this weekend, and I’m sure as we’ll look back at this as old-stuff in ten years, just as we now view an early model Ford. Sailing in a Sunboat is a lot of fun. No exhaust fumes, no noise, and no worries about paying for gas. Just pure silence. Did somebody say silence is golden? This has got to be it! This entry was posted in Solar Powered Boats and tagged solar boat, solar marine, Solar powered boat, sun boat, sunboat on July 4, 2017 by mogens. 2017 – Time to roll up your sleeves! First, on the upside, in 2016 the world finally could agree on a climate action accord. The accord sets a goal of arresting global warming below 2C. Considering how many times the world has tried to come to a ratified agreement, this is a major milestone in combating global warming. It was thought that global warming had had a hiatus in the first decade of this century. Recent analysis indicates not so. New measuring methods, which have an intrinsic lower bias value, caused averaged data to be lower. When temperature analysis is analyzed within categories of measuring devices, the data indicates an ever increasing temperature! An often overlooked side effect of global warming is the ever increasing ocean acidification. As oceans become more acidic, corals will start to dissolve – thus removing large fish habitats. There is nothing we can do to substitute this loss. The corals that flourish near ocean floor thermal vents where seawater is locally more acidic are proven poor fish habitats. Since these vents have persisted for many millennia, it’s reasonable to expect there’s no solution. It is a fact that ice coverage at the poles is rapidly decreasing. This winter, temperatures in Nuuk/Greenland measured over +5C when typical temperatures should be -10C or below. In September, on my return trip from Denmark, the ice coverage on the south western part of Greenland was non-existent. Unprecedented. Still in doubt? Current state of the art computer models that are fed historical data can correctly predict weather phenomena, historical, current and future. In fact, the simulators can render visual cloud covering pictures of the earth that you can readily compare against actual satellite pictures. The pictures eerily match! Still in doubt? We are now able to measure stratospheric temperatures. Global warming theory predicts that with additional CO2 (carbon dioxide), CH4 (methane/natural gas), and other man made gasses, form a blanket in the atmosphere causing low-altitude planet warming. Conversely, the stratosphere which is above the human caused blanket is predicted to cool. The new stratospheric measurements indicate just that. The stratosphere is cooling! The arctic tundra contains vast quantities of frozen biodegradable plant material. As arctic temperatures increase, the material will decompose and methane (natural gas) released. There’s no way we can capture the gas, and it will readily accelerate the warming effect. As a global warming gas, methane is 20 times more potent than carbon dioxide, albeit, it quickly breaks down, within 8 years, in the atmosphere. I fear this mechanism has the potential to cause a quick and unanticipated global warming acceleration. We know from fossilized northern European tree ring studies that climate change can rapidly occur. A massive release of fresh water from the Greenland inland ice sheet, which has already been initiated, will create a fresh water north Atlantic cold pool – effective shutting down the Gulf Stream. The consequences will be immediate and felt worldwide. Here in California we also see the effect of global warming. A recent drought ended in the winter 2015/16. Wintertime is when we should see a Sierra mountain snow accumulation. This winter, as of this writing, we have had slightly above precipitation – but most has come as rain. Mountain snow is regularly being washed away. Aside from poor Alpine skiing conditions, this matters because we use the snow pack as water storage from year-to-year. Unless we accumulate a decent snow pack, we will have insufficient storage to help us through a multi-year drought. Mankind has never had to be greatly concerned about nature. There has always been room to expand. Mines to be dug. Land to be plowed. Cities to be build. We are faced with a very different set of survival criteria than our forefathers just 100 years ago. Whereas our ancestors always had the option to immigrate, there’s no such option for people displaced by climate change – there’s nowhere else to go! For us to survive, we need to quickly switch to renewable living, as well as population control. It’s time to roll up our sleeves and get to work. And yes, the election of Trump can be nothing short of disastrous. His agenda is completely misdirected and will only cause additional hardship. This entry was posted in New Year's Messages on January 11, 2017 by mogens. In memory of Professor Filson Glanz, UNH. First; I apologize to the world for the election outcome. It stands in contrast to our California values and vision. Contrary to popular campaign rhetoric, this election was not about health care, student loans, women’s rights, equal rights, trade, immigration or jobs. All those issues can comfortably be dealt with over time and as we mature as a society. No, the current situation is dark, and the future very sinister because Climate Change has been ridiculed and all our work stands to be steamrolled. The atmospheric greenhouse gas load has achieved a level where it is likely a self-feeding run-away phenomena. Certainly, the quickly accellerating melting of Greenlands icesheet, and beginning methane release of melting tundra organic matter, indicates so. What can we do? With persistent low fossil fuel prices, there’s little incentive to switch. A carbon tax is now out of the question. The Obama EPA rules will undoubtedly be rewritten. Automotive electrification efforts will surely suffer a serious setback. The same goes with all other fuel efficiency efforts. California, with our Air Resource Board, will continue to be a bright source in setting new standards. Yet, our local efforts amount to nothing but a trickle in the efforts needed to curtail global warming. George W. Bush cost us a trillion++ dollars and untold lives. I see no reason why D. Trump wont cost us additional trillions, and who knows – perhaps we just lost our last chance to curtail Climate Change. Congratulations America, you picked a real winner! This entry was posted in Uncategorized on November 10, 2016 by mogens. Clearly there are additional circumstances that make the Syrian crisis worse than just global warming. Let us be clear, the Syrian refugee crisis is made worse by, in particular Russia’s efforts, including China, to prevent an expeditious settlement. That, however, is a topic for another day. Never the less, as warming consequences continue to worsen, this will become an all too common sight – and with ever increasing refugee floods. How peculiar it is how natural gas (NG) has come to the rescue of the the US’ CO2 emissions. Together with a bit of regulatory pressure, a large scale coal-to-NG conversion is taking place. There’s no doubt this will continue world wide. China is now in the midst of converting their plants, and I’m convinced India will follow if they can get access to reliable and inexpensive NG resources. Perhaps Iran, with its vast NG resources, can come to the rescue? Wouldn’t that be ironic? Solar PV technology continues to improve. 10 years ago it looked like standard PV module conversion efficiency would be limited to less than 25%. There are now indicators that new material and manufacturing research may boost efficiency to 28%. This will prove to be significant to bring down solar PV cost, and possibly throw solar tracking a badly needed lifeline. This entry was posted in New Year's Messages on February 4, 2016 by mogens. Palestinians fighting Israeli’s, Hutu’s fighting Tutsies, the wars in Afghanistan, Iraq, Sudan, Boko Haram, Al Qaeda – what do they all have in common? We will never be able to combat global warming unless we, stop fighting our insignificant wars. Why even bother picking a fight with your neighbor, when the end result spells doom for both. It’s time to stop squabbling, and focus on the big picture. This entry was posted in New Year's Messages on January 26, 2015 by mogens. Replies are very much welcome, but please try to stay on topic. If the topic is “global warming and ice melts”, let’s talk about just that and not “solar PV”! I will in the future try to moderate replies by deleting off-topic comments. Another point; don’t waste yours and my time with offers for commercial services. This site is meant to be informative and we don’t need any third parties to promote it. Let the site promote itself! This entry was posted in Uncategorized on September 29, 2014 by mogens.